he idea for this trip happened as sort of a spur of the moment. During the World Open, Negash Bezaleel and I were talking about a trip to Jamaica. I had missed the trip in April for the Jamaican Championships. 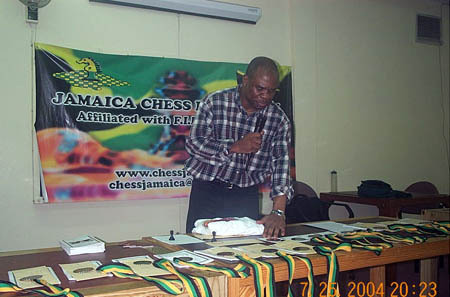 I had exchanged e-mail with Ian Wilkinson (President of Jamaican Chess Federation) and told him our intentions after which he suggested July 24-25th, the weekend of the Harold Chan Open. 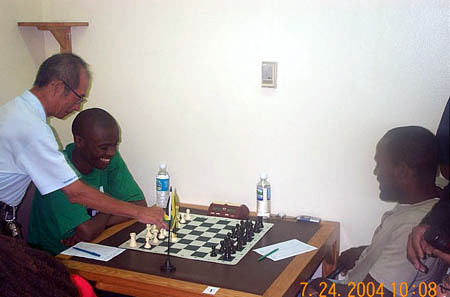 Ian had been discussing the possibility of several strong players visiting the island, so it was convenient to suggest that the Zambian International Master Amon Simutowe also come. In addition, both Amon and I are helping Ian with a particular chess project. Ultimately, Negash would pass up this trip and it would be Amon and I who would embark on the ambassadorial visit to the birthplace of great Pan-Africanist, Marcus Garvey. After a rain delay in Miami International airport, Amon and I boarded the American Airlines flight enroute to the "land of wood and water," Jamaica. The 6:14pm flight didn't leave until 7:14pm Miami time so I had to call Ian Wilkinson in Kingston to inform him. Finally, we boarded the plane and despite the heavy clouds and the lightening flickering in a distance… no problem. 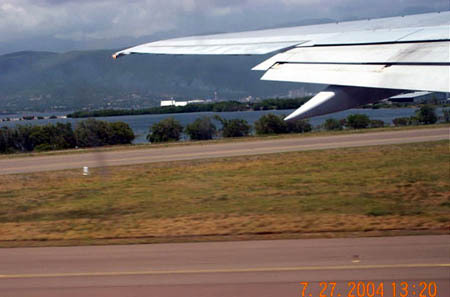 Amon was sitting in the last seat on the plane engrossed in Don Brown's book, "Deception Point." We touched down on Jamaican soil at about 7:50pm (Jamaica time) and were welcomed by a calm and welcoming Jamaican air… humid but pleasant. It's good to be in Jamaica! Getting through customs was a bit of a breeze, but when the agent asked the customary questions, I told her I was here for chess. "Chess!?" she exclaimed. 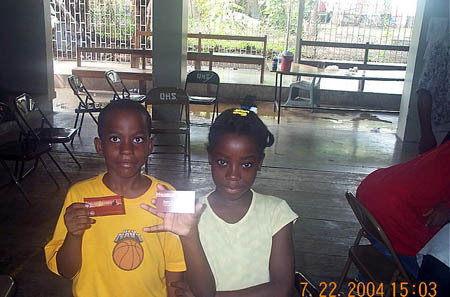 When I tried to explain to her about Jamaican chess, she never looked up from my passport and kept stamping away. Ian appeared out of the dark shadows of night to give us a welcoming greeting. We went to the van and Ian's girlfriend and fellow attorney, Shawn Steadman extended a warm Jamaican welcome. I had met her briefly at the 2002 World Open. FM Warren Elliott, Richie O'Sullivan (creator of jamaicachess.com) and a camera crew were on hand to tape a short segment about our chess ambitions and the purpose of our trip. 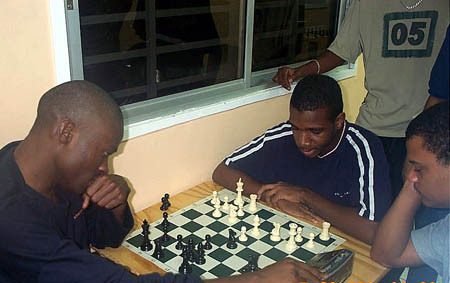 After enjoying dinner (and "juneplum fruit drinks") at the Jamrock Sports Bar and Grill, we went over to meet the Jamaican players taking part in an Olympiad training session at the Kaspablanca Chess Club. All of the players were waiting patiently as we were driving from the restaurant. When we got there, about eight players were involved in a "rise and fly" blitz set… winner keeps playing. 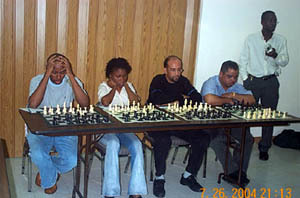 About eight players were huddled around the board watching Elliott-Malaku Lorne. When we entered, warm greetings followed. I had met a few of the players at previous World Opens while Amon had met some of them at previous Olympiads. As is common in many blitz sets, there is joking, a little bit of trash-talking and some theatrics. Elliott was "mashing up" the place when the Simutowe decided to clash with Elliott. The game was intense, but the Zambian #1 prevailed and preceded to take all that Jamaica could throw at him that night… but as Wilkinson would say, the Jamaican's will come to the Harold Chan with "blood in dem eyes!" It was a historic moment! We got a late start and at around 2:30pm, headed to a summer camp at Queen's High School. 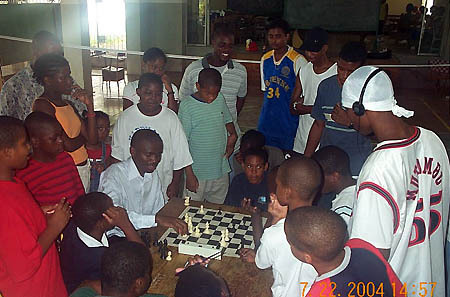 Geoffrey Byfield runs the Ligunea Chess Club and about 60 youth from his club were part of the camp. The playing area appeared to be a recreation room. 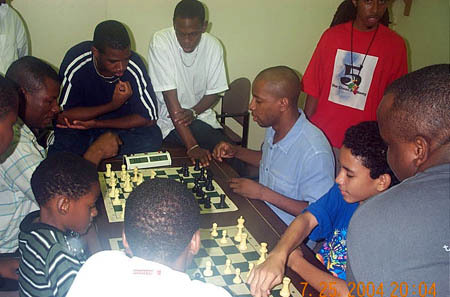 As we walked in, students were already in the midst of chess battle. Byfield performed introductions of both Amon and myself and then announced that Amon would be giving 5:1 blitz odds to all comers. When Byfield announced that I had business cards to leave, a literal mob took place and kids were grabbing for them. In a rush, I ran to get more and after passing out a stack of them, several of the youth made up an impromptu competition in collecting as many cards as they could! Some had as many as ten and wanted more! "Can I have three more?" one of them asked me. It was amusing. Amon was sitting down grilled to the board with 60 seconds to play all of his moves. One after one, his opponents fell. However, there was one player who caught everyone's attention. 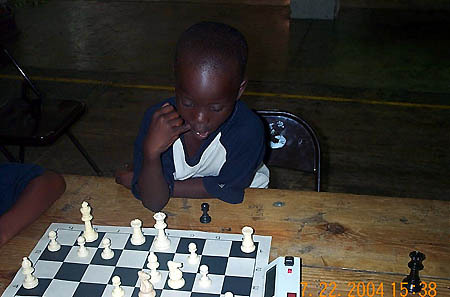 It was 8-year old Tewana Mellace (Jamaica's under-14 champion) who gave the Zambian IM the toughest battle. Amon told Andrew Mellace (Tewana's father) that his son was very talented and that he must keep playing. Looking at the formation he got against the highly-touted master, one can say that he an attacking mentality. Amon joked, "One day I'll be begging you for a draw!" Maybe it wasn't a joke. 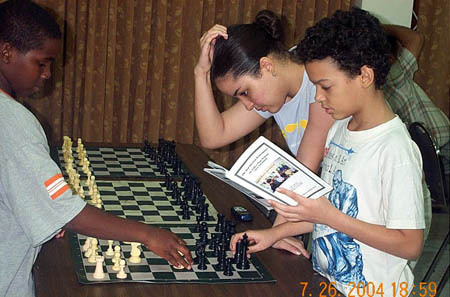 Nevertheless, good things are happening in Jamaican youth chess. Shawn came to pick us up and as we were about to leave, a Jamaica rain (amidst hurricane season) began a steady sprinkle. We jetted back to the vehicle and had a delicious dinner at Norma on the Terrace. We enjoyed a pleasant meal amidst the beautiful palm and banana trees and enjoyed stimulating conversation on a variety of topics. It is interesting that three people representing different parts of the African Diaspora could learn so much from each other. Amon has very interesting insights in chess. We had a talk on yesterday about how having a trainer can make a world of difference. He had mentioned an interaction he had with Nigel Short who has made a point of telling the chess media that Pentala Harikrishna was his protégé. I balked at that notion stating that Harikrishna was good long before Short, but Amon stated that top GMs understand chess so well that even a short session could make the difference. Agreed. Oft times players get stuck at a certain level and it takes a specialist to give them further insights. Short even asked Amon what happened to his ELO and why he hasn't progressed. Amon said he had no idea Short even knew of him. Before we set out for the day, he talked about professional chess players, their demeanor and focus. He mentioned that he was particularly impressed with China's Bu Xiangzhi and the fact that he does not show his emotions at the board. 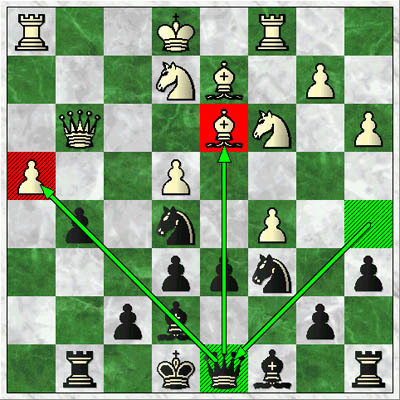 Of course, Kasparov shows himself fully while playing and in course, uses this to his advantage. Amon mentioned that he realizes that much of this has to do with focus and when he sees that he is blundering, he realizes that something internal is wrong. 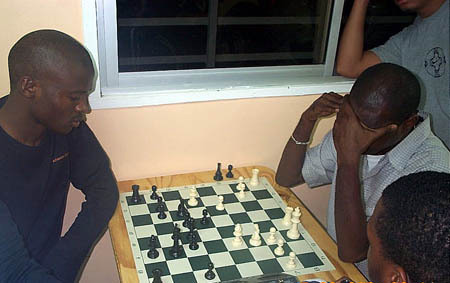 Amon stated that IM Watu Kobese called him and asked why he didn't beat Ivan Sokolov in the first game in Libya. Focus. Focus. Focus. 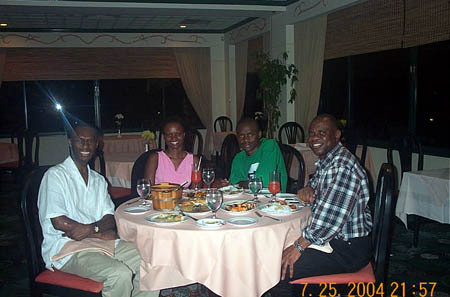 After a nice meal at the Hot Pot Jamaican restaurant, we went to Ian Wilkinson and Company. You guessed correctly… it is the law firm of the charismatic Jamaican Chess Don, Ian Wilkinson. 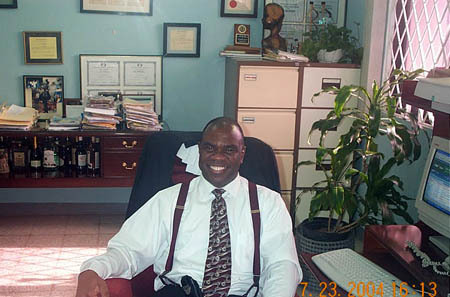 He visited with him shortly during his busy day and relaxed in his spacious office adorned with plants and walls dotted with legal credentials. However, there was a wall plaque that caught my attention… it was a picture of two football (soccer) teams. "I played a mean game of football," he stated. He mentioned that was a dribbler and played attacking midfield/forward. My kind of player! 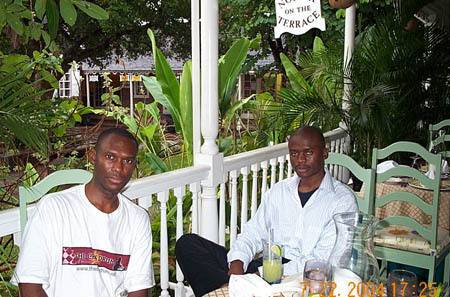 In the evening, we went to the famous Pegasus Hotel to do a video shoot. On the way over, Ian and I were discussing dancehall reggae artists Bounty Killer, Spragga Benz, Merciless, Elephant Man and veteran Papa San… music pulsing through the car. He asked Amon if he knew any Jamaican patois and then broke out into an impromptu staccato patois chant. Ian has such a great spirit and a fun person to be around. Later on Amon picked up a few words of patois. Hilarious! 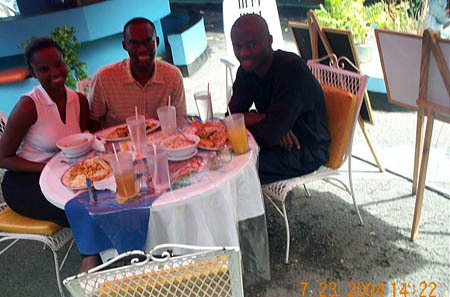 There were many Jamaican players present including Warren Elliott, Adrian Palmer and Gary Hew. Richie O'Sullivan was handling the audio-visual effects. 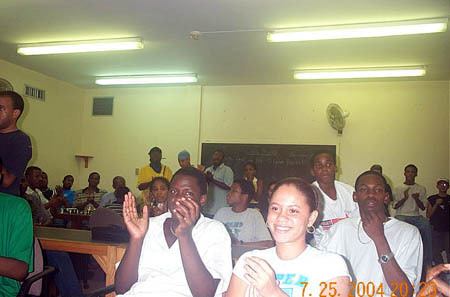 Elliott asked a series of questions on his beginnings, his travels, results, aspirations and recommendation for Jamaica youth. Afterwards, Elliott and Simutowe played a quick blitz session. Elliott proved that he has other talents besides chess and was natural in his role of the interviewer. He is also launching his "5-Star Chess Academy" which means he takes his role as National Champion seriously. 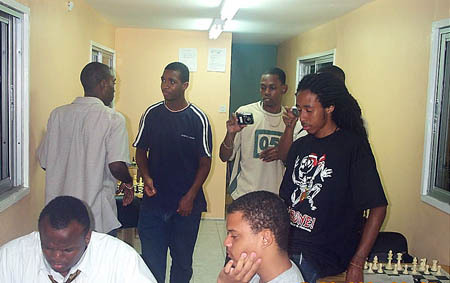 This was personally my first tournament abroad. I once played a blitz set with the national champion when visiting Bahrain. Of course this is all in great contrast to Amon who has logged enough miles to circle the world a couple of times. 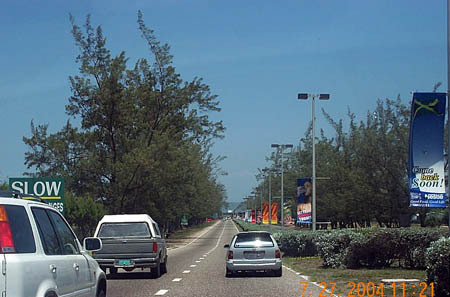 Driving toward the campus, we saw pleasant Caribbean scenery and people working off the roads. Shawn was telling us about famous landmarks. 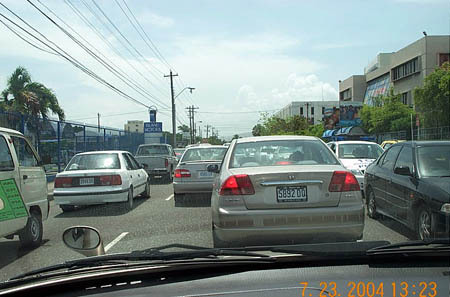 We were soon on a straightaway and a handsome white wall stating University of West Indies passed us on the left. We were running a bit behind schedule, but made it on time… players were still arriving for registration. 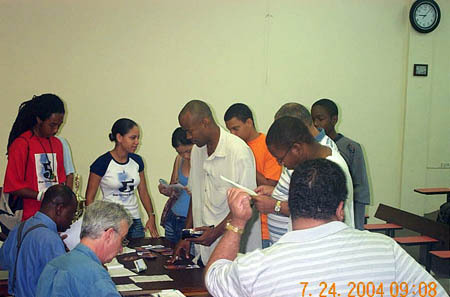 There were many players milling about waiting to be registered. Pleasantries were exchanged and everyone seemed in great spirits and in great anticipation to face an International Master. Oh… three rounds in one day. When talking to Amon about this, I could only reflect on the American system for tournaments and most recently, the Indian Championship. 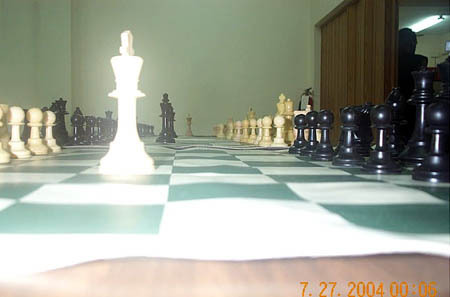 The Indian tournament featured 23 rounds of chess in two weeks and has been loudly criticized (GM Surya Ganguly won)! Nevertheless, everyone continued waiting as a few late-comers held up the proceedings. Finally, the pairings were announced and as they were called, the two players took their seats. Ian acknowledged both Amon and myself and the players were kind enough to give applause. After arbiter Bob Wheeler made final comments about appeals, the tournament began! 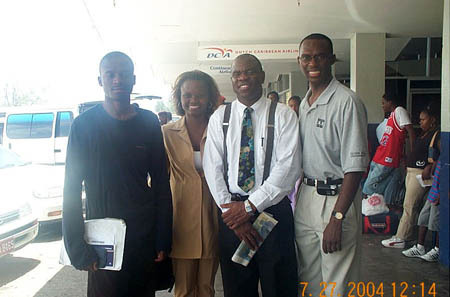 Last year at the U.S. Championship when IM-elect Stephen Muhammad and I were contemplating a visit to Jamaica, he said, "Don't go over there and mess up." While Amon was taking a casual approach, I wanted to make a strong showing. In the first round, most of the favorites won, but there were a couple of upsets. Jamaican Women's Champ Deborah Richards toppled Geoffrey Byfield and Markland Douglas beat NM Russel Porter who withdrew after losing. In the second round, several interesting matches were set. 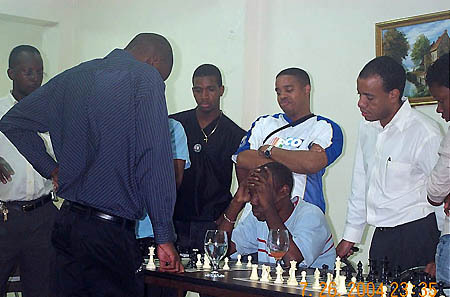 I faced Jamaican Master Duane Rowe and trotted out the Center Game (1.e4 e5 2.d4!? cxd4 3.Qxd4 Nc6 4.Qe3). We played an interesting game and I had chances to win, but the game was drawn. 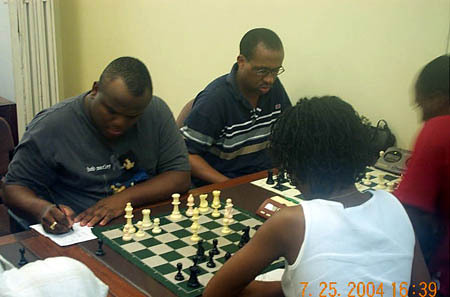 In the third round, I would play the black pieces against Jamaican National Champion Warren Elliott. We sat down to engage in a very interesting encounter and true to my irritable style, I played 1.d4 c5 2.d5 Nf6 3.Nc3 (3.c4 b5!) Qa5!? 4.Bd2 b5 5.e4 b4 6.e5 bxc3 7.Bxc3 Qa4!? 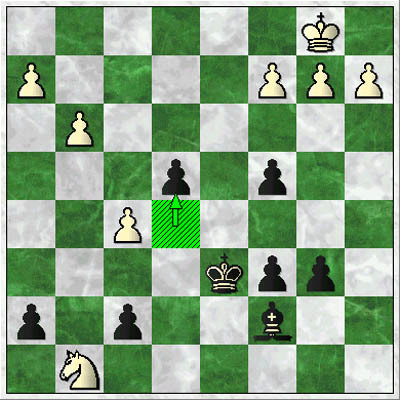 After the game, Elliott said he had never seen this idea before and allowed me to get an active game after 15…Rg8! with the idea of …Be6-d5. In Elliott-Shabazz, 18.d7+ was met by 18…Kd8!? Did I miss my chance? 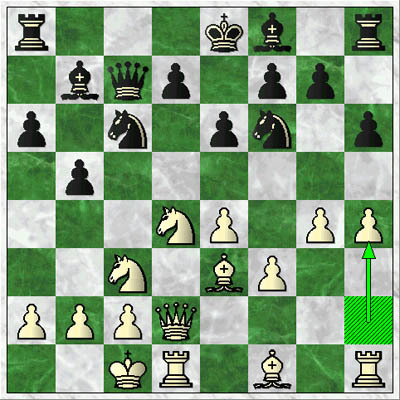 A critical position was reached a few moves later after 18.d7+ (above diagram). I had a tough decision to make and played 18…Kd8!? Play followed 19.Nh3 Bxh1 20.Ba5+ Rb6 21.Rxh1 Kxd7 22.Rd1+ Bd6?! 23.Bxb6 axb6 and black is better. The next day, Elliott claimed I missed a clear win with 18…Ke7! 19.Ba5 Bxh1 20.d8Q+ Rxd8 21.Bxd8 Ke6. 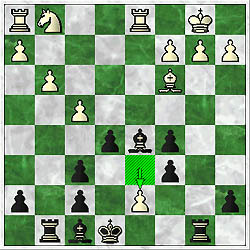 The other move 18…Kxd7 led to 19.Ne2 Bd6 20.Rhe1 Rhe8 21.a3 c4 with a definite plus for black. In any event, I missed the winning plan after 27.Rd7+ Kxd7 28. Nxf6+ Kd6 29.Nxg8 which was 29…e4! A truce was agreed at move 37 (see game). Three rounds down and three to go. Mi tired, mi tired. Amon was sitting at 3-0 after waltzing to victory over Peter Myers. Before we left for the tournament, Amon was talking to me the importance of seeing games live. He gave as an example Michael Adams' cool performance in Tripoli. Seeing games in person provides a new dimension because one can see the intensity, the facial expressions and the emotions tied into the positional battle. Amon had mentioned to me once before how he was inspired by watching Hikaru Nakamura during the FIDE World Championships. Interesting. These morning conversations with Amon were definitely educational… and coming from a young player who has played some of the top players in the world. Time has moved by quickly and this was the last day of the tournament. I was joking with Amon that we would probably meet at some point. I was showing him my game with Elliott and he was critical of 29…Bd8. He commented that 29…e4! was my chance. In the mornings, we would look at some interesting lines in some opening and had a good exchange of ideas. Amon had such a casual approach to the tournament and stated he just wanted to play chess without pressure. Maybe he was too relaxed. Me on the other hand, I wanted to win my last three games for +4. Yesterday I met long-time online friend Mark Bowen, who was one the first Jamaicans to visit The Chess Drum after its inception. During the 4th round of play, I met FM Grantel Gibbs (past President of the Jamaican Chess Federation), Bert Scott (creator of Jamaican Ambassadors Chess Academy) and Jomo Pitterson (a top Jamaican player). They could not play for a variety of reasons, but it was good to meet these men for the first time. They all came to watch the games with great interest. During the first round Amon was cruising through and was on 5-0 going into the finale. He would face Markland Douglas who had just beaten me in the 5th round in a tough battle. Elliott had beaten Rowe the 5th round, but still would not be paired with Amon. Elliott told me afterwards that his sole purpose for entering late was for a chance to play Amon. Thus, he and Malaku Lorne agreed to a quick draw in the last round. I would face Geoffrey Byfield who was also on 3-2. Byfield and I played a set of blitz games a his summer camp and I played badly, but I saw enough of his game to understand his weaknesses. 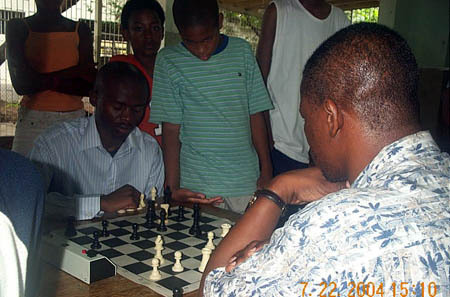 Byfield, who runs the successful Liguanea Chess Club, is known for playing the Smith-Morra Gambit (1.e4 c5 2. d4 cxd4 3.c3). I have always done well against this gambit, but have recently started declining with 3…d3!? This way I can transpose into an open system that Smith-Morra players seek to avoid. Look at the position to the right. Byfield has just played the hyper-aggressive 12.g4, but where does white find king safety? Has my opponent become overconfident? 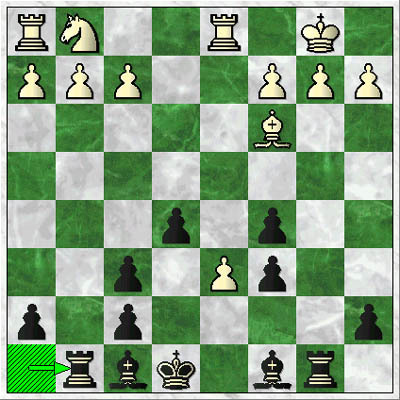 In Byfield-Shabazz, black played 12…g7-g5! to undermine protection for the e5-square. In the above diagram, 12…g5! 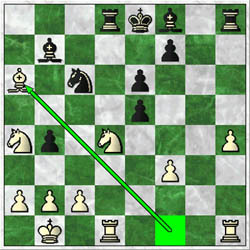 was played with the idea of gaining full control over the critical e5-square. Of course 13.fxe5?? is not possible due to 13…Ne5 and Nxd3+. GM Judit Polgar played a similar motif against Alexij Shirov some years ago and won brilliantly. 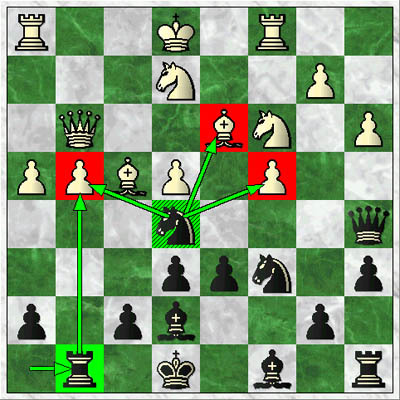 Byfield says he didn't see this move, but it is typical for a Sicilian player to see such ideas. After this move, white's position is in disarray and I continue to exert pressure with 16…Rg8 and later 19…Qd8! At this point, I left my seat to take a breath of fresh Jamaican air and felt a blunder coming. Moves later, Byfield played 22.Bf4?? and I immediately punched out 22…Bxh4! winning instantly. The victory was sweet in that I played well and exacted revenge for the thrashing in blitz (see game). Meanwhile, Simutowe was fighting for his life against Douglas and a major upset was brewing. "Dougnik" had already beaten Russel Porter, Mark Holness and me. 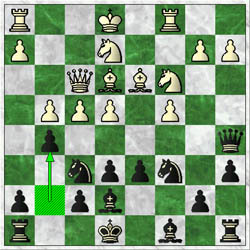 Simutowe trotted out the Taimanov Sicilian and a double-edged position ensued. Douglas went right after the jugular after 11.h4. A side story was that Ian had coached Douglas before the game and told him to play this particular line. 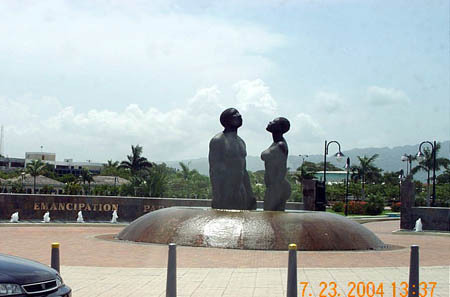 The Jamaicans were not about to allow Amon to waltz to victory without a fight. Amon made mention that Douglas took the game personally and expressed bad board manners. As the board exploded, the tide turned in black's favor. After both players made an exchange of errors, Douglas tried to fight back with 20.Bxa6! 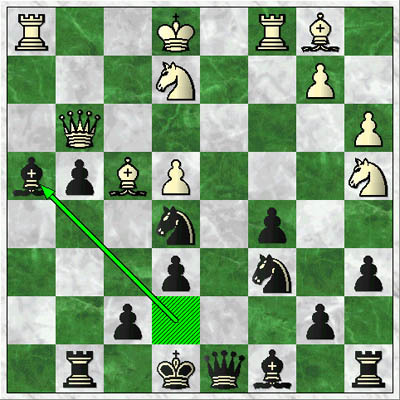 (diagram), but after 20.Nxd4 21.Bxb7 Rb8 22.Be4 f5 23.Bd3 Nxf3 24.c3 e4 black's central pawns started rolling up the board and eventually overran white's position (see game). The final victory makes Amon Simutowe the 2004 Harold Chan Open champion! In Douglas-Simutowe, white fought back with 20.Bf1xa6! 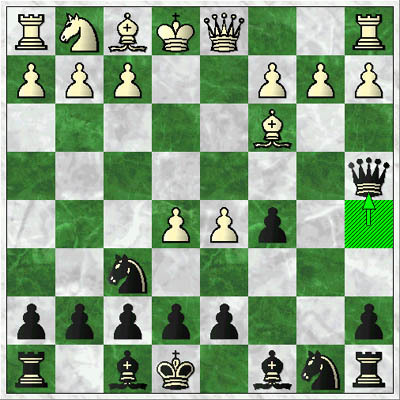 but black's central pawns were too much. 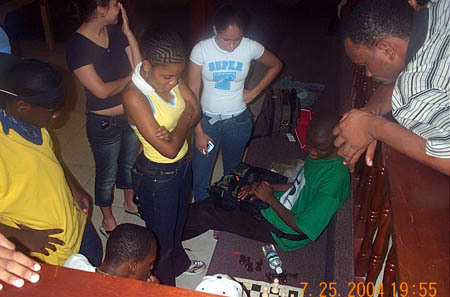 After the tournament, all the Jamaicans broke out and began to play blitz, bughouse and partake in analysis. Amon drew quite a crowd of admirers with his jovial spirit and fierce blitz play. I analyzed my game with Byfield and he stated that he was too aggressive. The analysis session was very productive. The closing ceremonies were interesting as Ian arranged a host of attractive medals on the front table for presentation. Awardees consisted of players from the Open, Women's and Amateur sections (under-18, under-16, under-14 under-12). I put my medal for 3rd overall (on 4-2) on with pride and was glad to be able to contribute the Wilbert Paige booklets and t-shirts I brought. It was a pleasant sight to see. Last day in Jamaica. It has been a wonderful stay in "the land of wood and water." Jamaicans have been friendly and welcoming. I told them, "We'll be baaaack!" After a short trip to Port Royal and some last minute souvenir-shopping, we went back to the apartment to prepare for the evening. When driving through a city like Kingston, you get to see the people close-up and it is not uncommon to see someone who looks like a relative. I have had this experience in many predominantly Black countries I've traveled to. We are separated by bodies of water, yet we are so close. Amon and I was scheduled to present a lecture before a simultaneous exhibition. 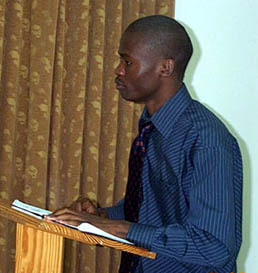 The lecture was to take place at the Shirley Retreat House, a 13-room hotel with an elegant abode. When we arrived, a group of players were playing bughouse again. 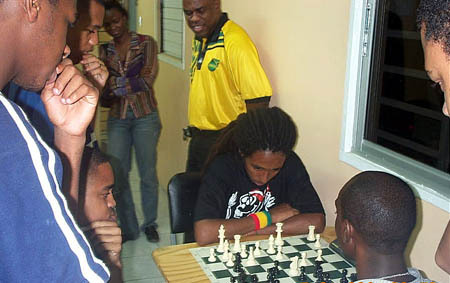 Jamaicans enjoy any form of blitz chess! There were a number of juniors present for the opportunity to participate in the simultaneous exhibition. In addition, junior players Tariq Walters and Brian Ewbank were going over one of Amon's losses in the Wilbert Paige booklet to understand how to beat him! This is a very encouraging sign. Interestingly enough, one of Jamaica's top players was in the crowd. I would later find out that Russel Porter was intending to ensure that the Zambian didn't leave the island without tasting defeat. Also in the crowd was a guest of mine! Yvonne McCalla Sobers is a Jamaican attorney and activist whom I met seven years ago in an online discussion group on economic development issues. I had responded to someone who made insensitive comments about Caribbean people and she also sent a response to the list. We exchanged e-mail over a period of time and I later found out she wrote a vegetarian Jamaican cookbook titled, "Delicious Jamaica!" This book has a beautiful cover and recipes for dishes like "cassava bammy," "duckanoo," "callaloo run down," "jerk tofu," and "breadfruit fries." 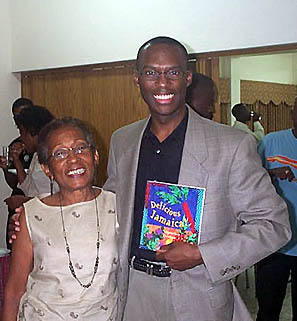 I ordered the book online and told her when I come to Jamaica, I wanted her autograph. Seven years later, we meet! The Internet certainly works wonders. Ian Wilkinson started the program by thanking everyone for coming out and discussing the importance of such an event. He gave me a gracious introduction after which I quickly abandoned my prepared notes. 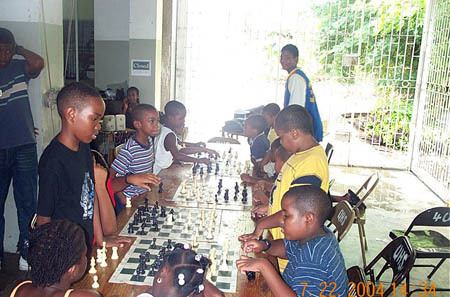 After my sincere thanks to Ian Wilkinson and the Jamaican chess community, I gave a bit of a background of The Chess Drum, how it evolved and basic statistics about the site (3400 pages, 150 countries, 34000 visitors/month). I mentioned some of the featured segments within the site which included news briefs, games, interviews and essays on various chess matters. I then discussed aspects of chess psychology and the metaphysical elements of our board sport. Chess allows us to engage in an internal dialogue and bring out our innermost feelings and expressions… often these expressions are exposed to the opponent which gives rise to psychological battles during the game. 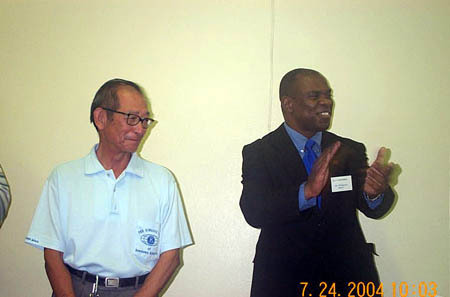 I gave a number of analogies which included some of my interactions with Grandmaster Maurice Ashley. One of my favorites is that "truth of the position is more important than principle." Sometimes sticking to principles can hinder us in finding the right idea in the position. Of course, experience allows one to break a few rules. 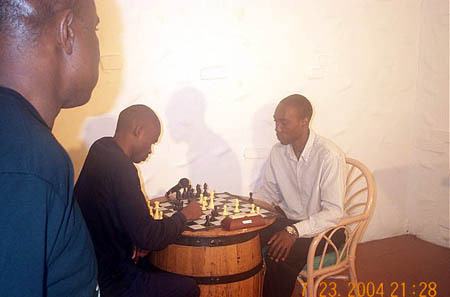 In the final analysis, I emphasized preparation, focus and confidence as being key factors in one's chess persona. Of course, confidence is a factor of how well one is prepared and preparation is a factor of how focused one is. These topics are very fascinating indeed. In the question and answer session, I was asked by Deborah Richards about the strongest Black female player. Tough question indeed since there is really no way to measure strength other than head-to-head matches and perhaps titles. Of course, Deborah can claim some right to the title in the Caribbean, but I mentioned players such as WFM Boikhutso Mudongo of Botswana, Raphaelle Delahaye of France and rising players such as Sabrina Chevannes of England and Medina Parrilla of the US. 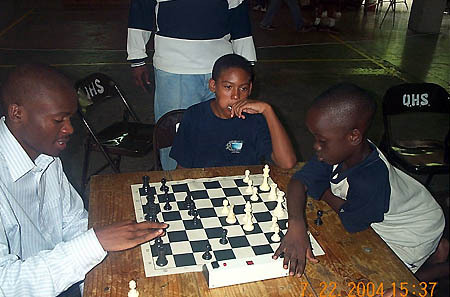 I also made mention of Baraka Shabazz, a phenom back in the 1980s who rose and then fell ingloriously from chess. Jamaican Women's Champion Deborah Richards (2nd from left) asked about Black female players…quite a common question. Richards has been scoring well in Jamaican "men's" events. 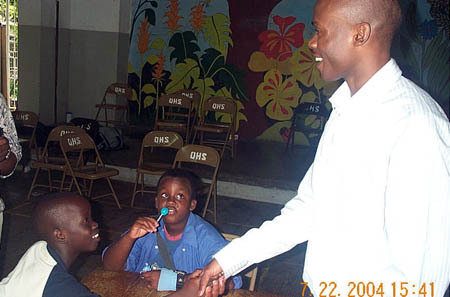 Ian brought forth the young Zambian Master who gave a delightful speech about his beginnings, his evolution as a player and his experiences in international tournaments. His presentation was tinged with a bit of irony and humour as he talked about his disregard for strong players… at the tender age of 12! In speaking of his first encounter with Zambia's national champion Cephas Sichilima, he was not impressed and openly referred to him as "weak." Some other players went back and told the Sichilima what Amon said and as fate would have it, they were paired against each other! 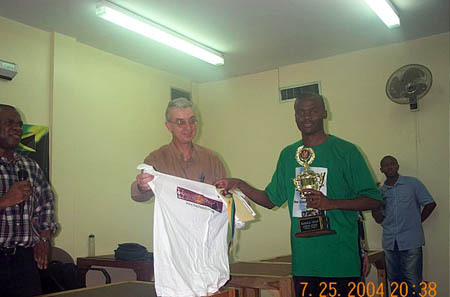 Sichilima won the game, but Amon gained confidence and began one of the most remarkable sports stories in African history. 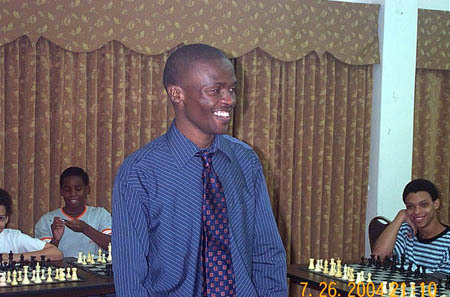 Amon recounted some of his successes including winning the national championship at age 14 and the African Junior championships in 1999 and 2000. He mentioned his foray into international chess when he defeated IM Colin Crouch who appeared more excited about the game than Amon was. Crouch annotated and published the game in the British newspapers! Needless to say, the game was a gem. Amon gave some insightful advice when encouraging players to take the game seriously (even when a piece up). 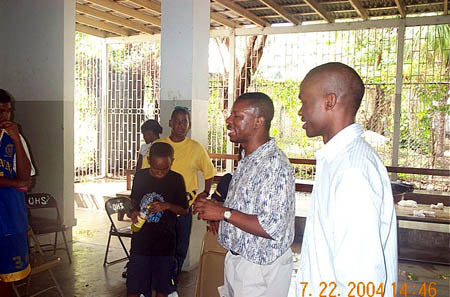 For training, he advised working in groups and find a consistent plan. His study regiment was up to six hours a day, but he admonished, "what matters is what you get in." In terms of computers, he stated that it is better to WORK FIRST, then check with the computer! When asked about books, he mentioned that the book that had an early influence on him was Catastrophe in the Opening, but he has also used "lateral thinking" techniques such as reading Sun Tzu's The Art of War. "Read books that explain in words," he advised. He mentioned that he prefers studying middlegames and endgames because they help to develop intuition. "Anyone can calculate tactics. Tactics are easy to see, but understanding the game is much harder." Despite advice for choosing books, he stated that players should not play according to fashion. "Play what you feel like playing. That way you are more ambitious and energetic," he stated. Of course, chess has its bitter moments. Amon talked about the time when Swiss GM Vadim Milov didn't want to sign the scoresheet after losing a match to him 2-0. Milov had beaten him in the preliminary round, but Amon prepared himself psychologically to beat him. I remember Amon sending me an e-mail telling me, "Got him twice." When asked if he would prefer to be a millionaire versus being a Grandmaster, the 22-year old GM stated, "I really love chess. I've learned a lot… about life… about struggles… people I've met. I don't think I would've learned as much (without chess)." 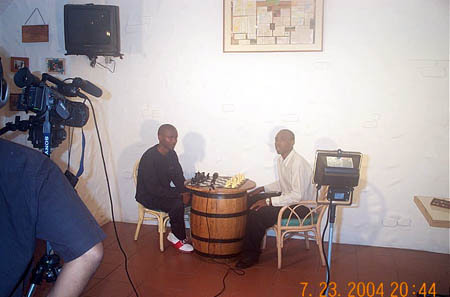 As he said that, I said to myself that it is a marvel that a young man from Ndola, Zambia could travel around the world to 30 countries due to chess. This is truly a wonderful game that we play. After dining on refreshments, the room was prepared for a 15-board simultaneous exhibition. The players took their seats and Bob Wheeler explained the rules for the exhibition making clear that only one "pass" was allowed. Wilkinson was on board #1 and Porter represented the last stand at board #15. There were a number of junior players and three players from the national team: Warren Elliott, Russel Porter and Deborah Richards. 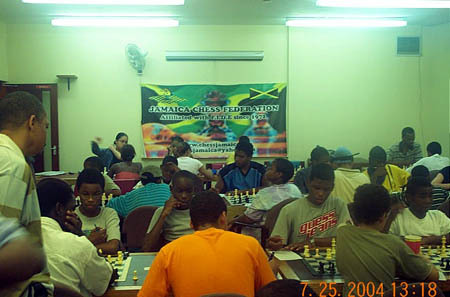 The other players consisted of players from the Jamaican Chess Federation. After three hours of play, Amon won convincingly 13½-1½. The last game was with Elliott which lasted until midnight (read full story here). After the simul, we milled about and said our goodbyes. During this trip, I developed a increased respect for Elliott because of his energy, his will to test himself and his efforts toward promoting the game. 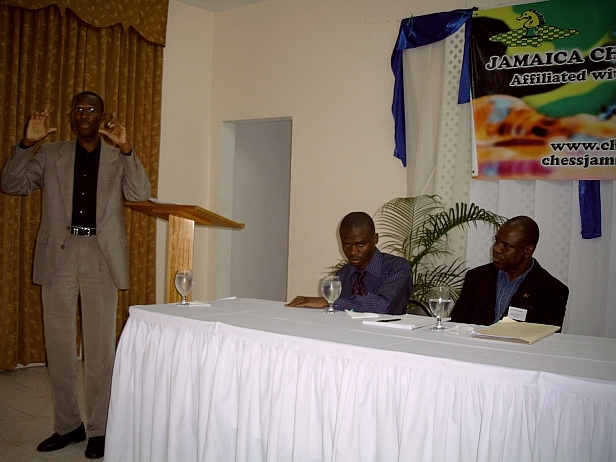 His launching of the "5-Star Chess Academy" is a testament that Jamaican chess is headed in the right direction. wake up in my class! 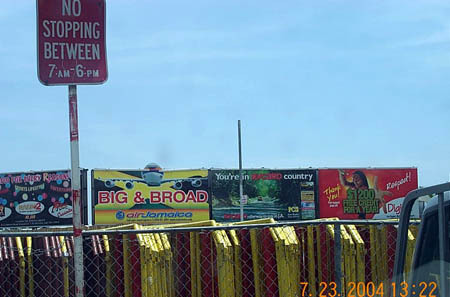 Well… this was the day we were leaving Jamaica. What a week! 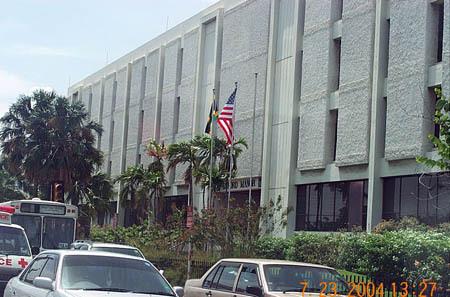 Hopefully, the Jamaicans will come to appreciate what occurred on this visit. Amon and I developed many pleasant memories and some light-hearted humour about this trip. Our experience was enriched by the generosity of both Ian Wilkinson and his girlfriend, Shawn Steadman. Not enough can be said about Shawn and her tireless efforts to ensure that we were comfortable during our stay. It was actually a bit overwhelming. The beautiful spirit of Jamaican women made me realize why Jamaican men are always so happy! 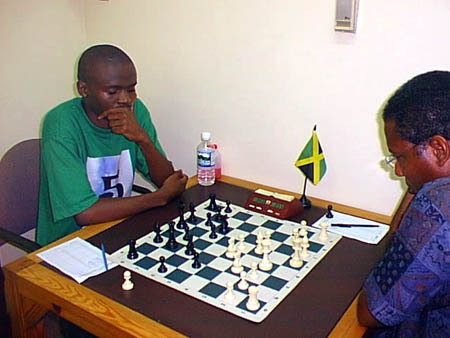 The Chess Drum, "Simutowe gives simultaneous exhibition in Jamaica,"
The Chess Drum, "Pan-African chess wave hits Jamaica,"